Analysis How does the UK find its way out of the DAB disaster? First, we have to get beyond the denial stage and into acceptance. One thing is certain: the UK can't carry on the way it's been going. Digital radio's year-on-year sales growth fell off a cliff the moment the BBC stopped its "DABaganda" TV ad campaign in the run-up to Christmas 2005, and sales growth has continued to slide ever since. That's despite every receiver being pseudo-subsidised by the BBC's TV adverts to the tune of £25. The Beeb has run 19 such campaigns. The sales chart shows DAB is a failing format, and if it were subject to the market, it would be on its way to the format graveyard. Successful formats don't need free adverts on BBC TV to prop them up. Since the DAB system consists of technologies that date back to the 1980s, the ideal solution would be to switch it off and start all over again. Unfortunately, there are already 6.5 million DAB receivers in the market, so that might lead to a few complaints. One of the things the broadcasters have been doing wrong, ironically, is that in trying to push everyone towards DAB they've actually been holding back the number of people who would choose to listen digitally. Eighty-seven per cent of all households now have digital TV and 60 per cent of households have broadband, both of which carry digital radio. So the BBC should logically promote all of the digital radio platforms on an equal footing, giving consumers the choice of which platform they want to listen on, without the BBC deciding for them. Listening to the BBC's internet radio streams jumped 22 per cent in one month on the back of the launch of the streaming iPlayer. That's six times faster than the rate at which DAB radio set sales are increasing, and the internet radio streams weren't even being directly advertised. 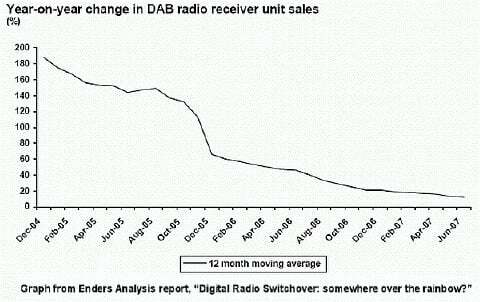 This shows that concentrating solely on DAB is holding back digital radio take-up as a whole. The BBC also admitted last year that DAB had become "prohibitively expensive" to roll out to everyone (DAB works out as being four times more expensive than FM (BBC pdf) to provide universal coverage), and coverage isn't even universal. We now know that only 90 per cent of the population will ever receive the BBC's stations on DAB. So the BBC shouldn't be promoting DAB as if it's the one and only way to receive digital radio - because six million people in the UK will never receive it. DAB's main problem from a listener's standpoint is simply that it provides poor audio quality. Far too many people suffer from poor reception quality: people hear the dreaded "bubbling mud" if they're receiving a weak DAB signal. The choice of stations is also poor. The solution is to switch to using DAB+ instead. DAB+ is really just the old DAB system but with the AAC+ audio codec and Reed-Solomon (RS) error correction coding added "on top". AAC+ is three times as efficient as the MP2 codec DAB uses, which means DAB+ can provide much higher audio quality and carry more stations. The stronger error correction coding makes reception quality far more robust, too: the bubbling mud would disappear for virtually everyone if stations switched to using DAB+. The sad thing is that AAC (without the ë+í) and RS coding were both available from 1997 onwards - five years before the BBC relaunched DAB in 2002. The current fiasco was entirely avoidable.